During summer, Gazprom announced record gas deliveries to Europe, with exports of 586.5mn m³ (or 544mn standard European m³) on August 16. During summer, Gazprom announced record gas deliveries to Europe with exports of 586.5mn m³ (or 544mn standard European m³) on August 16. Norway has also seen record exports this summer. The economic incentive to increase market share is pushing Gazprom to export more than the 2016 record level to Europe (151bn m³*). In its H1 17 results, Gazprom sales to Europe (EU & Turkey) were up by 9%. So, EU-27 dependency on Gazprom gas (35% in 2016) is likely to go up this year as mentioned in previous monthly updates. To market the previously mostly unused Opal capacities, the first auctions started August 1, on the crossborder capacity platform Prisma. 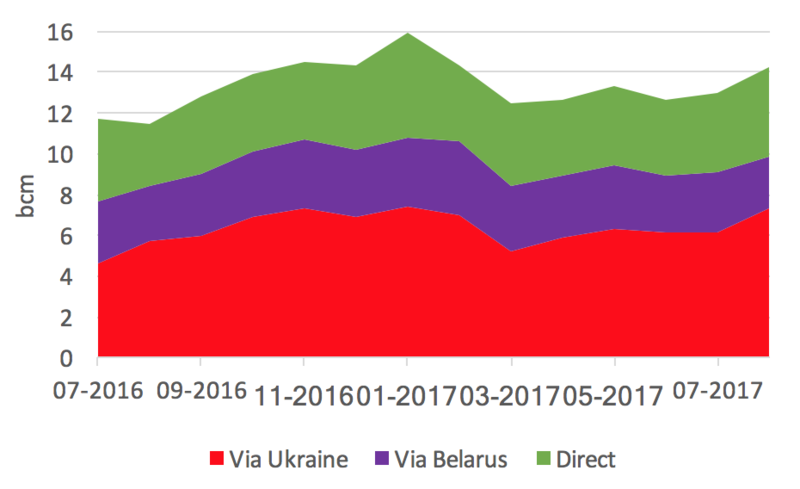 As expected Gazprom is now using Nord Stream more (+ 0.5bn m³ in August vs July or 12%) but interesting the flows via Ukraine have increased even more (+1.2bn m³ August vs July or +19%)… Only flows via Belarus have dropped (-0.4bn m³ August vs July or -19%). In August, Gazprom did not use all the Nord Stream 1 capacity made available following the lifting of the restriction on capacity in Opal. 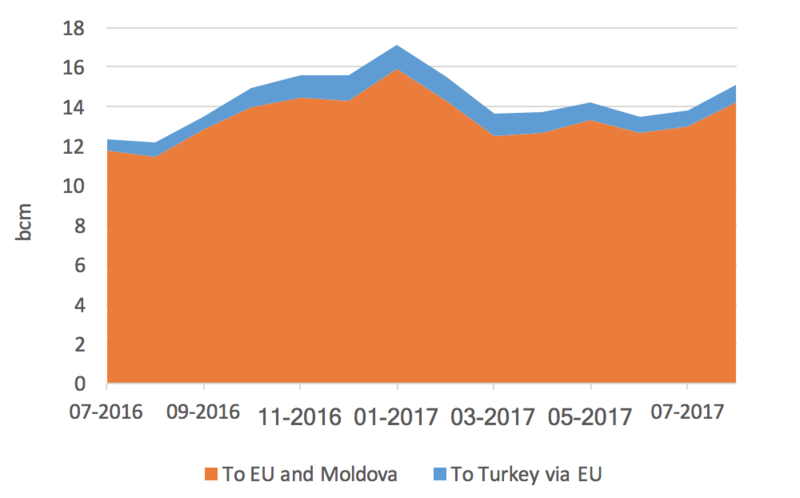 If we compare August 2017 with January 2017, direct flows from Russia to EU were 2bn m³ higher in January while flows through Ukraine were nearly at the same level. This tends to prove that Gazprom could, in the coming months, switch 2bn m³/month away from Ukraine. As 82.2bn m³ transited provided Naftogaz with $2.3bn revenues in 2016 (ie $28mn/bn m³ transited on average), such a rerouting would negatively impact Naftogaz transit revenues by $56mn/month at the full benefit of Gazprom, as it does not cost the latter much more to operate Nord Stream 1 at full capacity compared with the regulated cap set in the past. *European m³ except where stated otherwise.